I'd like to start out by apologizing for sharing this graphic image. 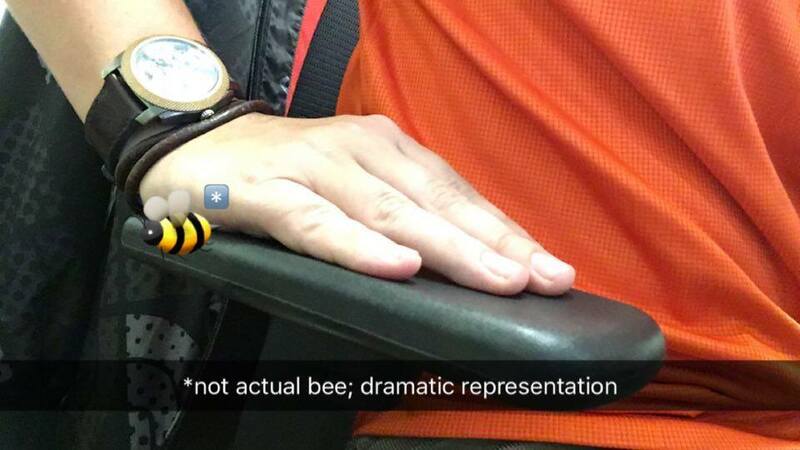 At first glance it may appear as if an actual bee has landed on my hand, but upon closer examination you can see that I have in fact inserted a bee emoji into the photo for dramatic effect in order to display my traumatic experience last week. The bee is to scale, though. And this is not the first attack on a Grace employee! Last week, after posting HUMPDAY, I stood up from my chair, placing my hands like so on the arm rests. All of the sudden, it felt as if though I had been punctured by a tack. The sharp pain briefly subsided as the lone wasp flew away. As I was still processing what just happened, the pain was swiftly replaced with an incredible burning sensation. So I did what any rational grown man would do in this situation and immediately went to the closest motherly figure I could find for comfort. Fortunately, our office lacks little in diversity and boasts many strong female leads like a Suzanne Collins novel. Their maternal instincts kicked in, first aid kits appeared, but of course I was making a bigger deal out of the situation than needed and at the behest of another coworker, a simple ice cube sufficed. Upon receipt of my faux complaint about wasps being shipped with our products, an audible gasp emmitted from the sales department. Edna, though dismayed for a brief moment, picked up the phone and called me out immediately. We laughed and now she calls me Bee-Boy.